Small and mid-size manufacturers will open their doors along with large companies such as Northrop Grumman, Ghirardelli Chocolate Company, Sandvik Coromant, Volvo, Taylor Guitars, Johnson & Johnson, Herman Miller, Leatherman, and TaylorMade Golf. MEP centers across the country have focused their energies on MFG Day and its potential to attract the next generation of skilled employees. New Jersey MEP and 40 partners will celebrate women’s contributions to manufacturing; the Florida Advanced Technical Education Center (FLATE), a National Science Foundation Center, and its collaborators will support student tours of more than 50 high-tech manufacturing facilities; in Massachusetts, MassMEP and state partners created a new Applied Manufacturing Technology Pathway Certification to promote careers in manufacturing and to create a standard instruction set and evaluation process; and in Portland, Ore., OMEP will kick of its MFG Day celebrations today with a sold-out screening of the American Made Movie. These are just a few of the activities that will bring together manufacturers, community members, government officials, educators, students and all the people who contribute to and benefit from a strong manufacturing sector. The Commerce Department and other government agencies are joining the celebration. Commerce Secretary Penny Pritzker will join President Obama on a visit to Millennium Steel in Princeton, Ind. ; Deputy Secretary Bruce Andrews is visiting Northrop Grumman; and Acting Under Secretary for Standards and Technology and Acting NIST Director Willie May will visit several companies in Delaware. If you can’t make it to an event, or simply want to see more, MFG Day media sponsor Science Channel will air round-the-clock episodes of HOW IT'S MADE, showcasing the fascinating, technologically-advanced world of manufacturing. The Science Channel is supporting MFG Day across its portfolio, including the cable network, ScienceChannel.com, social media platforms, and tours of its post-production studio at Discovery Communications in Silver Spring, Md. At the U.S. Department of Commerce, it is our job to promote job creation, economic growth, sustainable development and improved standards of living for all Americans—our neighbors. 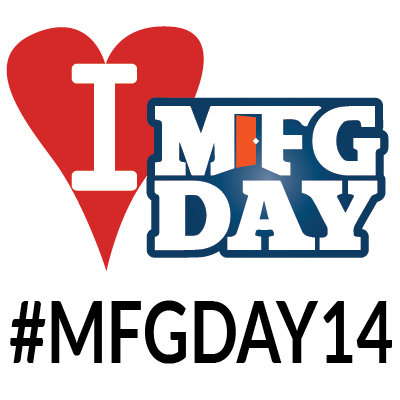 On MFG Day we celebrate the industry that helps make this happen. Join us and see what what’s being made in your neighborhood: http://www.mfgday.com/events. From your neighbors at NIST MEP!